Starring: Charlie Hunnam, Robert Pattinson, Sienna Miller, Tom Holland, and more. 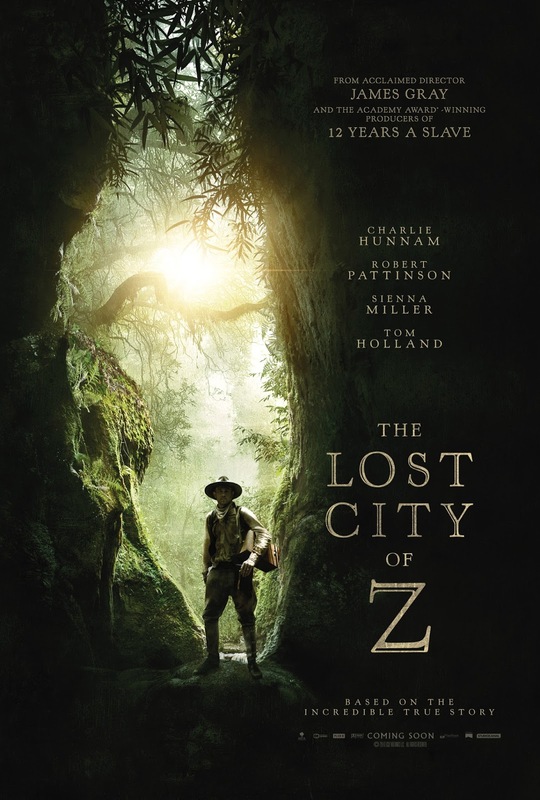 Here with another requested review, we are focusing on a film called ‘The Lost City of Z’ starring Charlie Hunnam playing explorer Percy Fawcett. To be honest, I only vaguely heard of this film. I never saw a trailer, never heard any buzz about it, nothing. The only thing I did know was it had quite the underrated cast with lead actor Charlie Hunnam as well as supporting actors Tom Holland and Robert Pattinson. So without anymore words, let us get into this review regardless of how blind I may be to the film. I was overall impressed by how invested I got in ‘The Lost City of Z”. To be honest, as I learned it was mostly an exploration film, I did not have any high expectations and the early bit of the film did not help its case as it dragged for a moment or two. As the film progressed, the character of Percy Fawcett and his ideals and beliefs were something to idolize and support. As far as the film goes, it presented Fawcett as a peaceful man. He believed in equality for all. He did not buy into the standard stereotype of the time where anyone from the jungle or the Amazon was instantly a “savage”. It was really something to enjoy, scene by scene, as Fawcett’s character interacted with his countrymen, family, and foreign parties on his destined mission to find the city of Z. Character wise, this may be my favorite aspect of the film. Charlie Hunnam is fantastic as Percy Fawcett. Sienna Miller as the wife, Nina Fawcett, equaled Charlie’s performance being a symbol of bravery and understanding. Tom Holland as the oldest kid, Jack Fawcett, was a joy to watch as we, the audience, watched his growth of young boy to sidekick to his father. Now most impressively though, second to Charlie, would be Robert Pattinson as Henry Costin. Henry was the true partner to Percy, accompanying him through expedition and war. Every moment that Robert was on screen as Henry, he owned the show and was compelling to watch. I personally think he is very underrated as an actor and on top of it, this film is simply filled with underrated talent. My main gripe with this film is that it cuts away from scenes far too often than I would like. As a certain scene was just reaching its climax point, it would then cut to a new scene of Fawcett leaving that immediate scene or even cut back to him returning to England or something of that nature. Although I understand this film covers events that span over twenty or even thirty some years within a two hour and twenty-one minute film that it could not possibly be stretched out much more. It would have been better, in my perspective, to see how some of the events played out besides leaving it up to assumption. Under the radar and mostly unknown, ‘The Lost City of Z’ is an exciting and interesting film about the expeditions of Percy Fawcett. While I did not expect much to begin with, I was pleasantly impressed by how much I actually did enjoy the film and learning about this character from a film perspective. Anchored by talented performances by Charlie Hunnam, Robert Pattinson, Sienna Miller, and more. This film is definitely worth the watch if you come across it. It is nothing to be blown away by but it is, at least, an enjoyable watch while killing time. Posted in 2017 Movies, Movie Review, Oberrated Requests.Tagged 2017, Charlie Hunnam, James Gray, Movie Blogger, Movie Reviews, Movies, Robert Pattinson, Sienna Miller, The Lost City of Z, Tom Holland.